This is a blog post I didn’t think I would be writing for some years. Unfortunately, some things are just not meant to be. 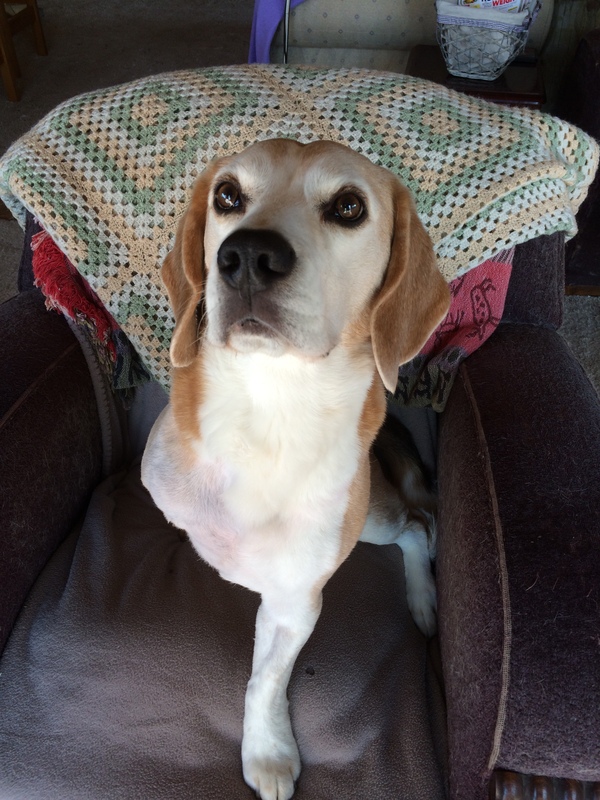 Teddy, the Beagle who so bravely came back from a front leg amputation last year, passed away on Saturday. He was only 8 years old – gone too soon. Some days he seemed like his old self, others not. Sometimes his liver function tests came back as abnormal, then re-tests would show an improvement after changing his core food. But late last week, things turned quickly. Teddy vomited up his breakfast on Tuesday and then stopped eating and drinking. 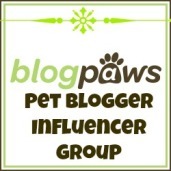 Another blood test showed highly escalated liver enzymes and Teddy was in trouble. He was booked initially for an ultrasound on Monday but then he had to go to the vet on Friday for fluids and stayed overnight. The ultrasound was moved up to Saturday. Jill took a distressed Teddy home and her regular vet came to give him his final injection. As Jill said, there was no choice. When I saw Jill yesterday, she just said that in writing Teddy’s last story, she wanted his story to matter. I’ve thought really hard about this. I think everything about Teddy mattered. He was a Beagle that was just a little too large to win in the show ring (despite winning best baby puppy several times). Early on, Jill discovered that Teddy was born with bilateral hip dysplasia and she set about keeping him happy and healthy (I came into the picture in 2010 after an unsuccessful attempt at hydrotherapy, because Teddy also had neck problems that were aggravated by swimming). When I lost Daisy last July, it was Teddy who would come and sit beside me in sympathy. And then last August’s horrible accident and the amputation which was going to affect Teddy’s mobility as he aged. And he came through it like a trooper. When I adopted Izzy (my greyhound), I took her for a visit and a 3-legged Teddy was zooming after her as if nothing had changed. So, what do Teddy’s last days tell us? I think they tell us that no matter how well we take care of our dogs, and with our best intentions for seeing them to old age, we really have very little influence when the end comes. We do our best. And we have to make the right decisions for our dogs in the face of critical or terminal illness. I’m glad that Teddy came through his amputation so well and that he and Jill had months together that they wouldn’t have had if she had decided to end his life then. And I’m glad Teddy didn’t suffer for days and days like people suffering from terminal cancer do. Teddy is one of those special clients that I will carry in my heart for the remainder of my days. 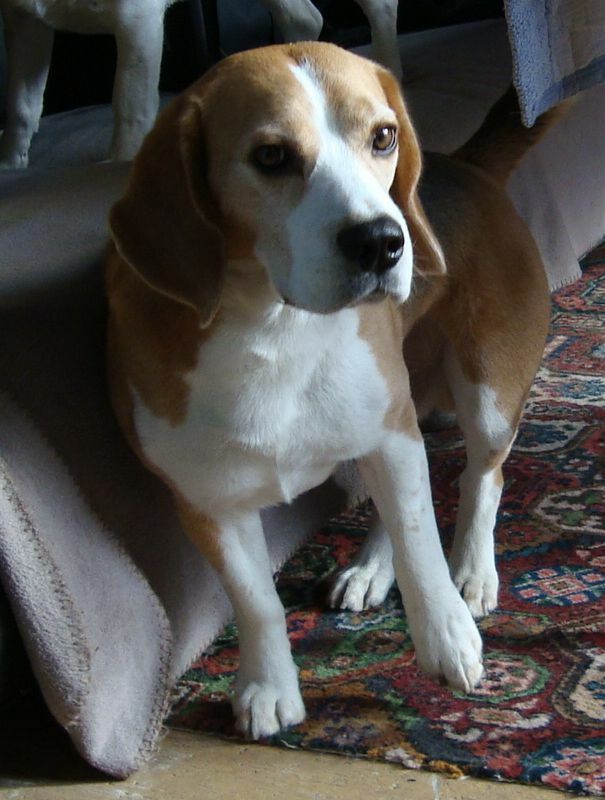 He was My Favourite Beagle. Everything about him matters. It’s been a while since I had an update on Teddy and this is very much a case of ‘no news is good news.’ Teddy is doing great. Here’s a photo taken by Jill earlier today. It’s Teddy in the kitchen demonstrating his reach and food drive. 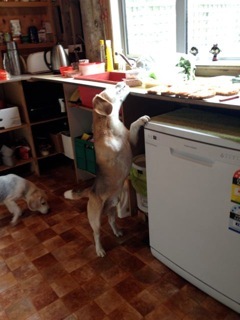 As Jill says, ‘drive is something they look for in the Beagle standard.’ Jill knew that Teddy was reaching the counter because he stole a bunch of cheese off the top of toasted cheese sandwiches earlier in the week! Jill remarked that she and Teddy now have a routine, but it means the same walk every day in the same location, and of course adjusting to limiting his activities to avoid stress and strain on his joints. The solution: variety! Teddy’s is a smart boy and he needs jobs to keep him mentally active. Little things like distributing food around the house and garden for him to find will provide Teddy with stimulation and something else to do. Changing paddocks for Teddy’s walks and even getting other dogs to visit with him for play dates will also give Teddy variety in his day-to-day life. And, as mentioned last week, Teddy needs greater core strength. 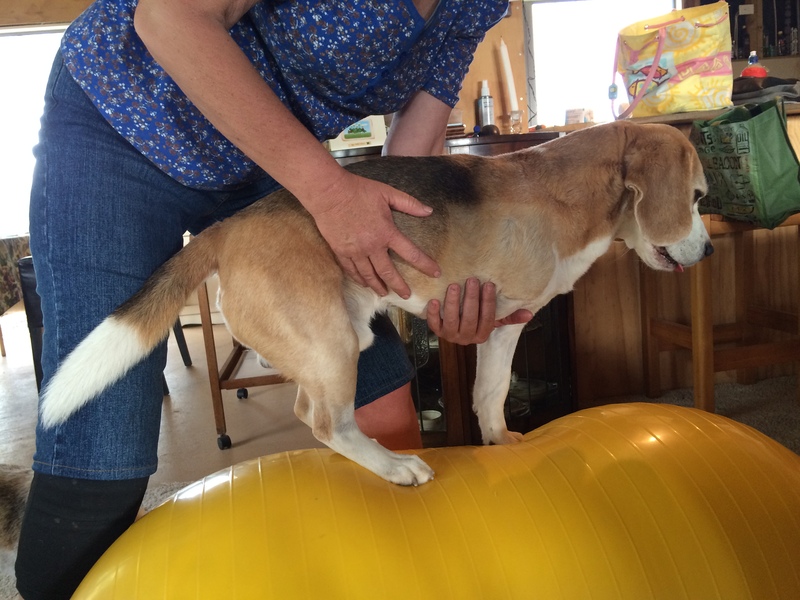 I showed Jill the value of supervised balancing exercises using a large peanut-sized ball from the FitPaws range. These exercises, done on a soft surface that ‘wobbles’ slightly, require Teddy to balance on his 3 remaining legs. In doing so, it means he works on his core muscles to keep his body steady. I want greater core strength in Teddy before progressing to exercises for his proprioception. And in case you missed it, I’ve already answered What’s proprioception? Jill has been working to ‘Teddy-proof’ her home so that Teddy can be left alone in the house but without any hazards that could cause him harm. Our biggest concern is Teddy jumping off of furniture (something he did regularly in his quadruped days). The focus initially was on having soft landings for Teddy and furniture with very high seats has been removed/relocated. But, in Teddy’s enthusiasm to be a good guard dog, he would often climb onto the back of the sofa and jump from that height. This would be extremely dangerous for Teddy now that he has only one front leg and with arthritis forming in the paw of that leg, too. 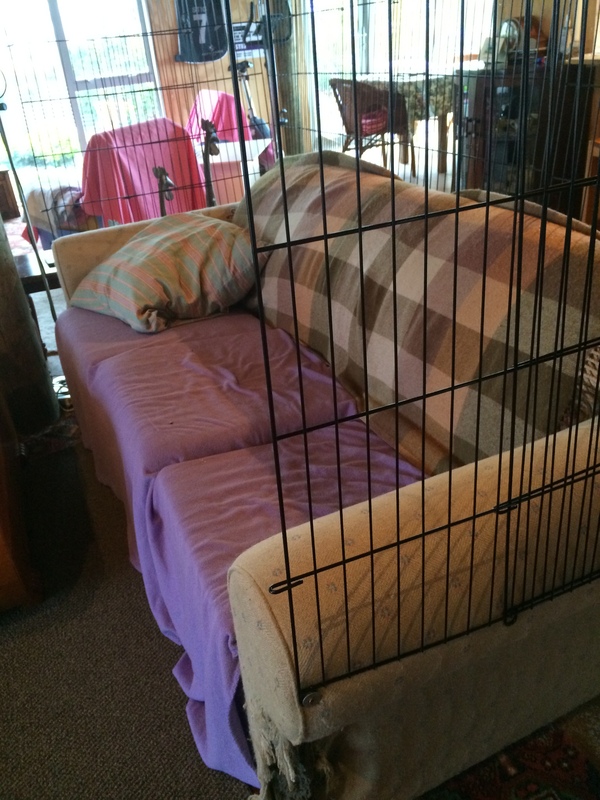 Solution: Jill purchased puppy fencing and has permanently attached it to the sofa. Teddy can safely get up on the sofa (with padding on the floor for when he dismounts), but he can’t jump off the back because he’s effectively caged in. 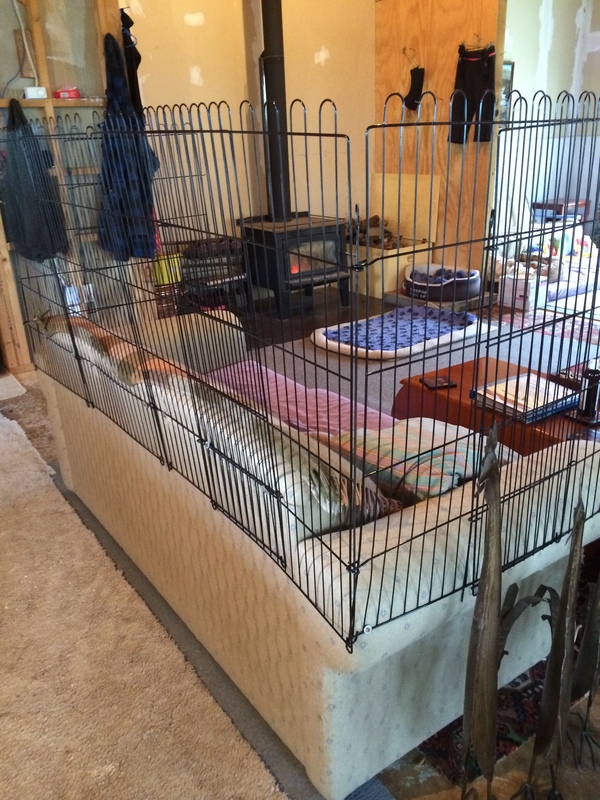 (Jill’s husband says that the sofa fencing doesn’t make any difference to the comfort of the sofa. Teddy agrees). What do you think about her protection efforts? Teddy continues to improve, although he requires more strengthening in his core, and Jill has made this their new priority. It’s been a good weekend for Teddy. 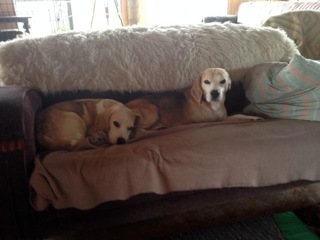 Jill says family life is getting back to normal, with Teddy and his sister enjoying some time together on the sofa – the first opportunity they’ve had for a long time. Jill has re-arranged the furniture to ensure that any areas where Teddy might be interested in jumping onto or off of are fenced off. Her husband has built a ramp to the dog door which Teddy is handling beautifully (we will aim to get a photo of this up soon). Teddy is definitely feeling better these days. 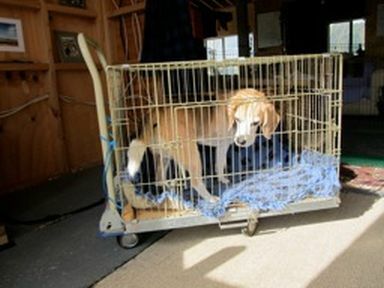 Jill was worried because Teddy, normally a vocal hound, hadn’t vocalized since his amputation surgery. Not to worry – his voice is back! Teddy has had another good week; he’s still getting used to being an amputee, however. Jill and his acupuncture vet, Susanne, both noticed that Teddy was hopping on his right hind leg – balancing mostly on the stronger left side. By the time I saw Teddy on Friday, Teddy was already improving thanks to acupuncture and an osteopathic adjustment. I spent most of his massage session working on tension in his upper thoracic spine, and giving his hind legs a good stretch. 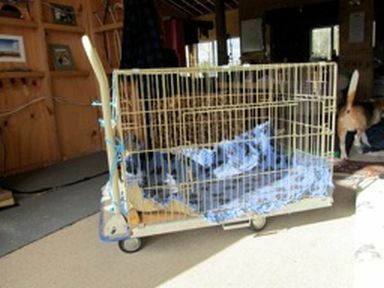 Because Teddy still needs to be confined, without the opportunity to engage in lots of vigorous off-lead exercise, Jill has found some novel ways of getting Teddy around the house and their lifestyle block. 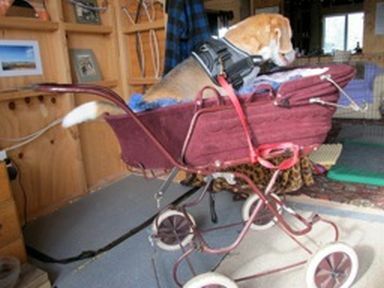 …and then she purchased him a pram on Trade Me (New Zealand’s equivalent of eBay) and can take him around the paddocks with the other Beagles. The pram has an added benefit, too. Teddy has to balance in it because of how it rides on springs. 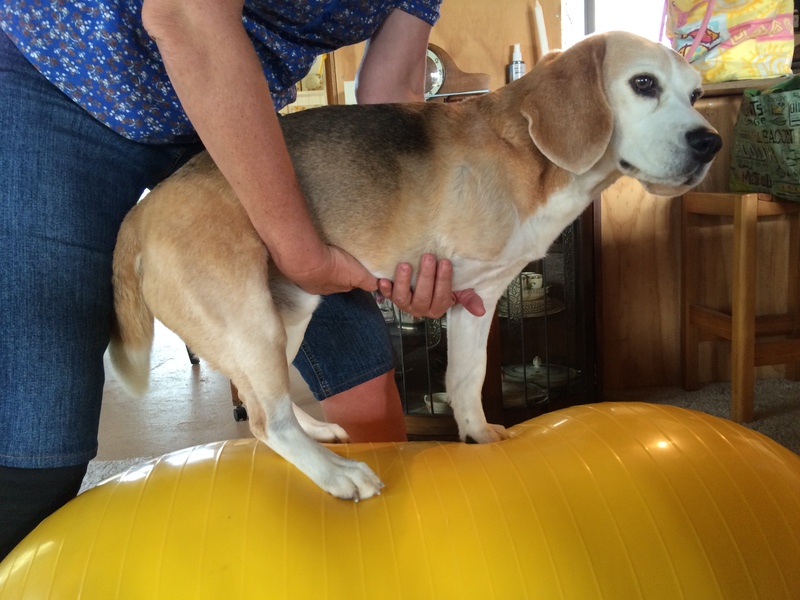 This is helping him build strength in his core – essential to achieve our goals for rehabilitation. Tell me what you think of Teddy’s wheels!